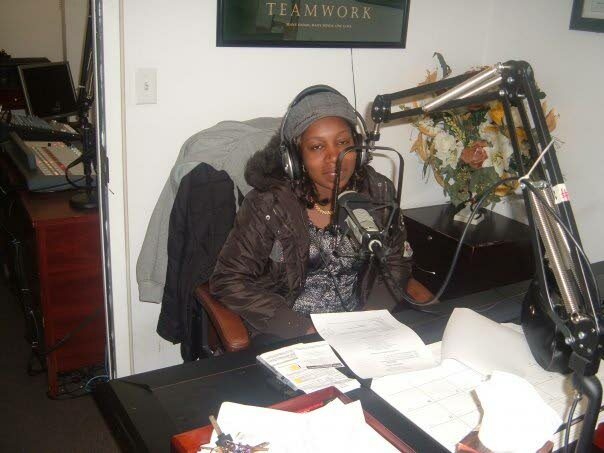 Carletta Figaro hosting a radio programme while abroad encouraging long-time immigrants to assist and support new ones. The programme was called Footprints in the Sand. She admitted knowing a feeling of hopelessness while being in her first trimester with one of her six children. And again facing that feeling of doom with her last child. Her eyes filled with tears, just thinking that she would have deprived the world of any of her beautiful children had she given into that hopelessness and aborted that baby. Her last child is now two and is a joy to the entire family, she said, with a smile. Carletta "Anisa" Figaro, 42, who chose life, is now seeking to be a voice that will encourage, empower and inspire other women and girls, who find themselves at that crossroad. Now also a grandmother, Figaro formed the She Chose Life Foundation out of her own turmoil surviving two broken marriages, caring for a seriously ill child and being a single mother even while pregnant. Figaro's resolve also comes from the experiences of her mother, Sylvia Figaro. She does not remember much about her mother who died when she was just two. But the cause of her mother’s death resonated. She died at age 36 from a botched abortion. She had left behind eight children: two boys and six girls. "I remember staying with an aunt and never being told until in my mid-teens. My step father pleaded with us girls never to have an abortion. He particularly spoke to me as I was told I looked most like her," she recalled, wistfully. Her stepfather, Wilson "Uncle Willie" Wilkins, fathered five Sylvia’s eight children. Four of his biological children were girls. Figaro said he was so adamant about being pro-life life that he committed to caring for all six girls into their adulthood, until his death four years ago. It was this act of selflessness, she said, that inspired her even when she did not have resources to. Her motivation even in the face of her own challenges is the gratitude freely expressed by persons she assisted. "It happened only recently. I met a woman at Maritime, who walked up to me and reminded me about a twin stroller I had given her babies 10 years ago. It touched my heart, because, with this economy, it’s a struggle to really be able to help the numbers of people that really either reach out for help or I see in genuine need," she stated passionately. A flyer for the She Chose Life Foundation, a pro-life organisation headed by Carletta Figaro. Figaro, who has spent most of her life in media marketing and classifieds, has now committed to supporting those who face similar struggles that she and her mother faced. "It was a real touch and go for me many times since becoming a mother. My failed second relationship saw me depressed and suicidal, with three children to care for. I chose to migrate rather than to give in to the morbid temptation to leave my kids behind," she said. Figaro spent three years in the US, not realizing that God was going to direct her studies to better equip her for her future personal mission. She pursued baby nursing and food safety management. While abroad, she said her children longed for home, and she sent them back to Trinidad. She returned shortly after in 2009 and returned to the media. "My last two pregnancies were hardest I think and I really had to hold on to my step-father’s pleas not to make irrational decisions," she said. She again faced a failing legal marriage and financial troubles. Depression again hit when she broke up with her husband, found out she was pregnant and her daughter suddenly fell ill in November 2015. Still she chose life and opted to bring that baby into the world even in the midst of her own chaos. Giving credit where it’s due, Figaro remembered her first common-law husband's support of their ill daughter, who has since recovered. She said he would take shifts with her, to stay at hospital during her illness and was a true father, even though they could not reunite. "This is what people in need want, not judgements, not criticism, not snide remarks or conditions on when or how you help. Just give when you can, and when you can't, seek the help of others to help others," she stressed. It was during the last few months of her daughter's stay at hospital that Figaro begun helping others. She became even more impassioned about her mission after several reports of babies being dumped at the nation's landfills. She would dip into her own little resources or seek out assistance from well-wishers for mothers or families she saw or heard of in need. Her sister, Mary Ramsey, sends much needed items from abroad, like baby milk, clothes, etc. And while the fledgling organisation is in the process of registration, they are currently based at #15 Luckput Street St James. She Chose Life, has six active members, including Figaro and her daughter and three directors. Anyone wishing to assist the Foundation can contact Figaro at 354-3558. 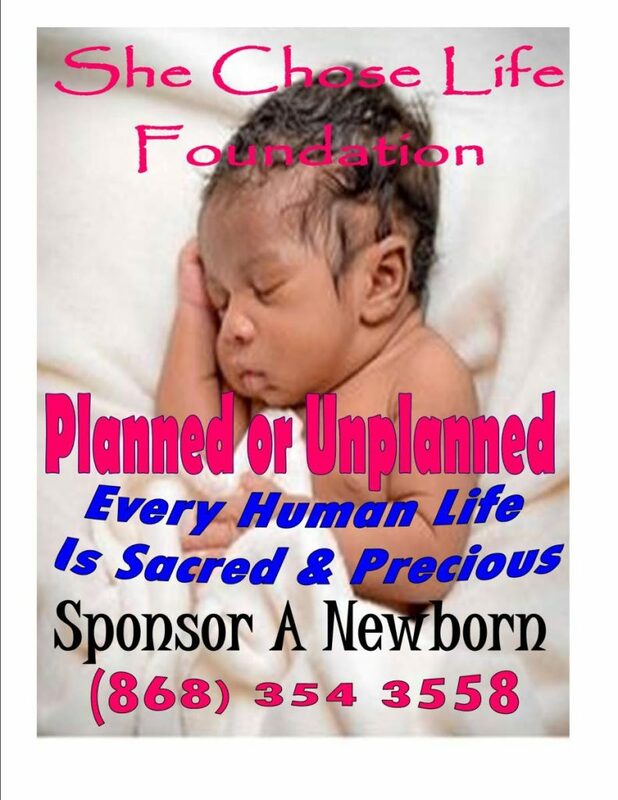 The She Chose Life Foundation started collecting baby clothes and supplies by reaching out to family, friends and anyone else who is able to help, to ensure that each baby in need receives a baby bundle with new and gently used infant clothing. Baby bundles include clothes, bottles, blankets, diapers, wipes, a toy, possibly a crib and car seat (depending on the need), a baby bathtub, toiletries and general supplies. Each bundle also provides the parents with development charts, immunisation schedules, child abuse prevention and child safety tips. Reply to "Carletta Figaro: She Chose Life"